We try to make Breakfast at Tiffany’s a memorable affair for our guests. 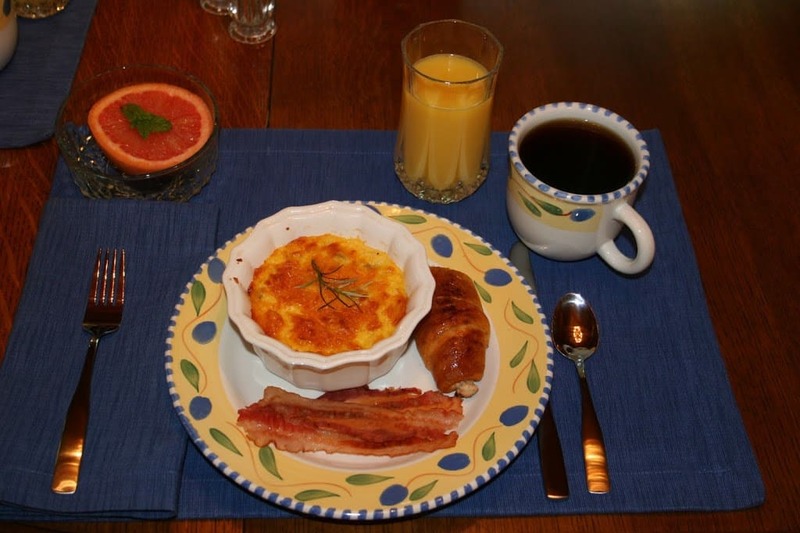 This recipe is one of our most popular, and before you turn your nose at the mention of “grits”, we must tell you that many a guest has said they don’t like them – only to join the “clean plate” club at the end of breakfast! In a large saucepan, bring water and salt to a boil. Slowly stir in grits. Reduce heat and cook 4-5 minutes, stirring occasionally. Remove grits from heat and add a small amount of hot grits into the eggs; add grits/egg mixture back into the saucepan. Stir in sausage, 1 cup cheese, milk and butter; stir until butter is melted. Pour into a greased 13X9X2-baking pan (we use individual ramekins). Sprinkle with remaining cheese. Bake at 350 degrees F for 50-55 minutes or until the top begins to brown. Yield: 10-12 servings. **To make in advance, prepare as directed – do not sprinkle cheese on top. Refrigerate or freeze. Bake 30 minutes, then sprinkle cheese on top & continue baking until the top begins to brown. Try it yourself, and let us know what you think!